THERE is no such thing as a dead rubber when it comes to a Test between the Wallabies and the All Blacks. The Bledisloe Cup may be lost, but there's so much more to be gained for the Wallabies in this weekend's Test against the world champions. The Wallabies will be walking into the lion's den in Japan. 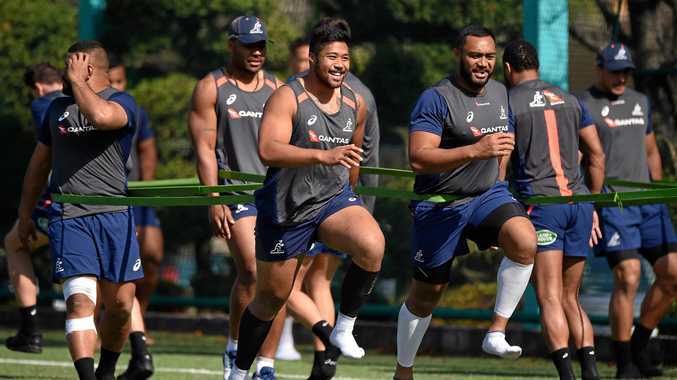 The Japanese people love the All Blacks - they're worshipped as gods in Japan - and they will have plenty of support when they walk onto the Yokohama Stadium turf. The Wallabies would have been disappointed by the results in the first two Bledisloe Cup Tests, which they lost by a combined total of 78-25. The bookies have installed the All Blacks as raging hot favourites for this afternoon's test, but the Wallabies are more than capable of pulling off an upset. How the Wallabies can beat the All Blacks: You can't beat around the bush when it comes to the All Blacks - there's a reason they've won the past two World Cups. They don't give their opponents an inch, they capitalise on any opportunity that's presented to them and they don't give up until the final whistle is blown. For the Wallabies to beat the All Blacks, they need to apply the blowtorch to them. They can't turn over cheap ball, they need to be dominant at the breakdown, they need to be dominant in the line-out and they need to apply scoreboard pressure to the New Zealand side. You can't be chasing points against the All Blacks. The Wallabies need to start well, go into the half-time break in front and then apply the blowtorch in the second half. Key men: It won't come as a shock to anyone, but Israel Folau is the key man for the Wallabies. Michael Cheika has thrown caution to the wind in picking Folau in the No.13 jersey, but it could also prove a masterstroke by the Australian coach. There's no harder position to defend than at outside centre, but Folau is the sort of player who will relish the challenge of being thrown into the front line in defence. He is the Wallabies' best attacking weapon and the positive is that he will get his hands on the ball more and pose a new and different threat to the All Blacks' defensive line. How the game can be lost: The All Blacks are a team that can attack you and hurt you from anywhere on the paddock. If the Wallabies don't win contested possession and they turn over cheap ball, it could get very ugly for them very quickly. The Wallabies need to take the game to New Zealand. The All Blacks love the arm wrestle and if the Wallabies look to play conservatively and just keep the ball in hand, the All Blacks will be more than happy to wait for the right breakdown to attack or sweat on an Australian mistake and then make them pay. Prediction: This time last year the Wallabies pulled off an upset by beating the All Blacks and they are more than capable of doing the same in Yokohama this afternoon. This game is not only important for the immediate result, but for what it does for the Wallabies in the future. With the World Cup just around the corner it's important for the Wallabies to get a win, not only for their own confidence, but also to give belief to Australian rugby fans. I'm tipping the Wallabies by seven in an absolute classic.